Many businesses can benefit from outside help selecting energy efficient equipment and applying for incentives, and our network of Qualified Partners offers just the assistance they need.With the increased importance of efficiency, rapid advances in technology, and growing demand for expertise with new equipment, now is the time to become one of our Qualified Partners. Our Program Allies have been integral to Efficiency Maine’s success in helping Maine businesses reduce their energy consumption and save money. With the increased importance of efficiency, rapid advances in technology, and growing demand for expertise with equipment, now is the time to strengthen this partnership. 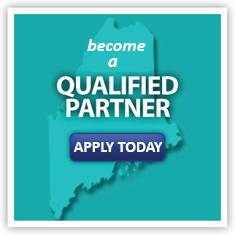 When your company qualifies to be an Efficiency Maine Qualified Partner, you’ll become eligible for dozens of benefits to help you gain new customers and perform your services more effectively.